After the birth of a child there's always the temptation to say "Yes, it's cute, but what can it do?" Until recently the answer was simply "lie there and cry", but now babies can be put on the payroll, so to speak, almost as soon as they're born. 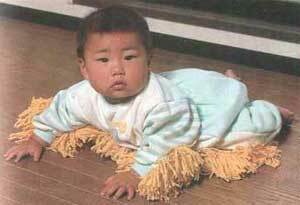 Just dress your young one in Baby Mops and set him or her down on any hard wood or tile floor that needs cleaning. You may at first need to get things started by calling to the infant from across the room, but pretty soon they'll be doing it all by themselves. There's no child exploitation involved. The kid is doing what he does best anyway. 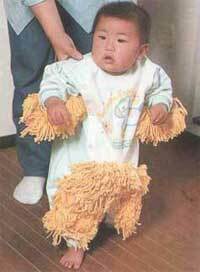 But with Baby Mops he's also learning responsibility and a healthy work ethic.